The first thing that comes to mind when thinking of Florida is often family theme parks like SeaWorld and Disney World. Or glitzy haunts of the wealthy like chic Miami Beach. Maybe you picture college kids flooding the beaches during spring break. But there is a good amount of stranger, more offbeat spots to visit in the Sunshine State. It's fairly easy to characterize U.S. states for their particular weird or unusual nature. And if you really think Florida is weird, consider that in Pennsylvania, the Gettysburg Dime Museum has an exhibit labeled "Lincoln's Last Bowel Movement." But still…for some reason, the state of Florida seems to have more of its share of the unusual or weird. It may be because of the transient nature of the state with its heavy reliance on part-time tourists. Or it may just be something in the water here. Either way, Florida has plenty of unusual attractions to go around and here are 15 of the best. 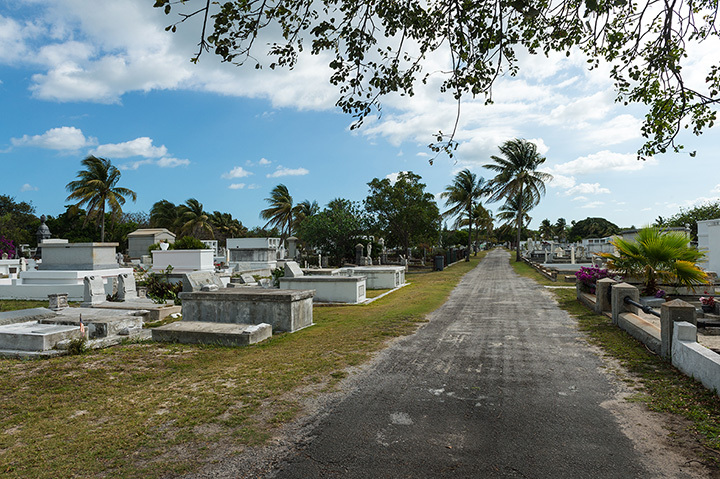 The city itself is home to about 25,000 people but the cemetery here created in 1847 has had an estimated 100,000 visitors. So it's obvious there are more dead people than live ones in Florida's farthest southern city. But never for a minute think this isn't a lively (and funny) place. Pearl Roberts' grave notoriously states "I told you I was sick." Also take a look at the tombstone of Gloria M. Russel, which declares, "I'm just resting my eyes." Be sure to look for the gravestone of Alan Dale Willcox, too: "If you're reading this, you desperately need a hobby." A self-guided map is available and it is best toured by bicycle. Here, you can experience a failure of gravity. Or so you think. You drive your car to the bottom of a hill and it seems to roll up the hill. This famous (or infamous) spot has attracted visitors for years and has become so popular the tiny city gives you directional signs for it (be aware that pranksters sometimes turn the signs around). There are all kinds of legendary spook stories about why this is happening but it may be comforting to know the real answer is simple: it's an optical illusion. You are driving along busy I-4 near Tampa when something forces you to pause: Eight Airstream classic RVs…upside down and sticking out of the ground just about 15 miles from downtown Tampa. It's the result of a local RV dealer who was inspired by the similar Cadillac Ranch in Amarillo, Texas. The Florida version is the "most underrated tourist attraction" in the state, according to the website Super Compressor, quoted in the Palm Beach Post. Its claim to fame: The world's largest freshwater swimming pool, and the only swimming pool to be protected by the National Register of Historic Places. It's the main tourist attraction in this suburban Miami city. It was created in 1923 from a coral rock quarry and the 820,000-gallon pool is fed with spring water from an underground aquifer. In the spring and summer seasons, the pool is filled and drained daily. There is a charge, but it's only $4.50 for children and $5.50 for adults. It claims to be the world's only underwater hotel. The name is no gimmick: The only way to enter the lodge is diving underwater. A single night's rate is $675 but there are various instructional packages for less. The rates have not driven off notable guests such as former Canadian Prime Minister Pierre Trudeau and actor Tim Allen. Magazines and television shows have repeatedly featured the unusual facility. If you have not guessed, this is the self-proclaimed "possum capital of the world" in Washington County. The monument came about because they claim in hard times, the only meat to be found in this small town was you know what. In addition to the monument, the community is home to the "Possum Palace," an entertainment venue and the home of the annual "Fun Day" and "Possum Festival." The celebration is held on the first Saturday of August each year. That is the day officially designated by the Florida Legislature as "Possum Day in Florida" (yes, even a contentious state legislature of Democrats and Republicans in 1982 could agree on it). The Possum Festival features a "Possum Queen and Possum King" contest, and a wide variety of other activities. Crowds for the events are in the thousands. This seven-by-eight foot, closet-sized room is the smallest post office in the country. The spot was once used as an irrigation pipe shed for a tomato farm. When a 1953 fire destroyed the Ochopee general store, which housed the post office, this tiny place became the official post office. The town, sitting on the edge of the Everglades, has a population of under 200 people. No one seems to complain about cramped quarters, and the postmistress who works as a clerk here says a telephone, an air conditioner and a computer are all she needs to do her daily work. Visitors can buy pre-stamped cards when the buses deposit tourists at the site. Talk about weird towns. This tiny town with no commercial development takes the prize, but its foundations are strictly serious. The town started during the late 19th century when it became the Southern Cassadaga Spiritualist Camp Meeting Association by a "trance medium," George P. Colby. The founder, a New York state resident, chose the site because of its energy level, according to its history. Knock on just about any door of the believers who live here and you can get a psychic reading. Prices start at about $20 for a reading. Visitors find an eerie quiet about the place (dogs don't bark, for example) that is not easily explainable. This is not your ordinary run-of-the-mill state park. It's really nothing more than a spectacular sinkhole. But more than that: In the middle of north Florida's sun-dried forests, it's a bowl-shaped cavity 120 feet deep that leads down to a small rain forest. Streams flow down steep slopes of a limestone sinkhole. It's a National Natural Landmark. Researchers have learned about the state's history through fossilized shark teeth, marine shells and fossilized remains of often extinct animals found in the "sink." Visitors have been coming here since the 1880s. If you are one of them, prepare to climb a lot. And if it happens to be a rainy day, prepare for a lot of mud. Yes, an entire bottle collection of various sizes made into a lighthouse in this Panhandle small town. A retired art teacher, Leon Wiesener, started it in 2012. He recalled that he simply woke up one day and told his wife, "I want to build a bottle house." The 500 square foot house is made up of 6,000 bottles. While you're in Carrabelle, you might as well make another stop to the world's smallest police station. In the early 1960s, Carrabelle's police phone was located in a call box that was attached to a building at the corner of U.S. Highway 98 and Tallahassee Street. Pranksters loved to make a call and force a uniformed cop to dredge through the rain to answer the phone. A replica of the station is a popular tourist stop for a photo. It's located on U.S. Highway 98 across the street from the Carrabelle Chamber of Commerce/Franklin County Visitor Center at 105 St. James Avenue. Television shows including The Tonight Show Starring Johnny Carson and others have featured it. A medieval-looking castle in Florida? Why not? There's already Cinderella's Castle at Disney World. Artist Howard Solomon recalls he was not very good in school but he knew how to work with his hands. The result is a castle in the tiny town of Ona. He built the aluminum covered castle by himself as a home for his family with the project beginning in 1974. The early material was aluminum printing plates thrown out by the local newspaper (that production method is now virtually extinct). Eventually, the three-story high castle covered 12,000 square feet. Its courtyard is filled with sculptures made from discarded auto parts. He never throws anything away so there are hundreds of sculptures, 3D recreations of famous artworks, moving items, stained glass and of course, a dragon. It has since evolved into a tourist attraction with a restaurant and art sales. Remember the movie "Planet of the Apes" where monkeys ran free and humans were in cages? This Dade County zoo likes to say it is like that: "Where Humans are caged and monkeys run wild." Maybe not exactly. But this home to 300 primates on a 30-acre preserve is a natural subtropical forest where wildlife lives much as they do in their natural state. It's one of the few protected habitats for endangered primates in the U.S., and unique in that it is the only one that the public can explore. Think a retail version of Ripley's "Believe it or Not." Located in an old Victorian home in the nation's oldest city, this former home of Wolfgang Von Mertz is often left out of the usual tourist maps. It's called a full retail museum because its bizarre oddities are always changing. The reason is that that almost all are for sale. What oddities? They range from an alien corpse to taxidermy figures such as Lizzie Borden in her "Bloody Boudoir." Haunted items, for the most part. The home is also said to be the residence of Brown Nose Burt, a man-eating rabbit in the courtyard. Just as there are few remaining drive-in theaters, churches where you stay in your car have not gone totally extinct. You will still find a few in Florida. One of the most famous remaining ones is the former Neptune Drive-in Theatre here with an entrance on Peninsula Drive. Services generally last 55 minutes. There are also several outdoor seating areas. Krispy Kreme doughnuts and hot coffee are served after the services.